TonerGreen Eco-Friendly Lexmark 12A8325 Toner Cartridge | TonerGreen - Eco-Friendly Toners from the U.S.
TonerGreen is an environmentally-concious online store that has been providing environmentally responsible printing solutions such as eco-friendly toner cartridges, eco-friendly ink cartridges and other eco-friendly printer supplies. TonerGreen offers a wide selection of eco-friendly remanufactured Lexmark toner cartridges that helps you cut down your printer cost by offering remanufactured laser printer toner cartridges compatible with Lexmark printer models. Our in-house manufacturing facility here in the US ensures that our remanufactured products are of excellent quality to match OEM standards. Our products can save you as much as 60% compared to OEM cartridges and in turn contribute in protecting our environment. TonerGreen happens to offer Eco-Friendly Lexmark 12A8325 Toner Cartridge ($75.00) for Lexmark Laser T430, Laser T430d and Laser T430dn. Remanufactured with up to 75% recycled components, our Eco-Friendly Lexmark 12A8325 Toner Cartridge is thoroughly engineered to meet or exceed OEM specifications. All our ink and toner cartridges are backed by 100% Risk-Free Guarantee. 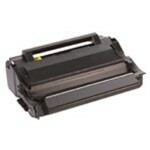 Our Lexmark toner cartridges are 100% Made in the US. Our factory is supervised by engineers and experienced technicians who are on-hand to monitor the effectiveness of the remanufacturing process. Furthermore, each TonerGreen Toner Cartridge is tested for output quality.